Blowfish is a keyed, symmetric cryptographic block cipher designed by Bruce Schneier in 1993 and placed in the public domain. Blowfish is included in a large number of cipher suites and encryption products, including SplashID. Blowfish’s security has been extensively tested and proven. As a public domain cipher, Blowfish has been subject to a significant amount of cryptanalysis, and full Blowfish encryption has never been broken. Blowfish is also one of the fastest block ciphers in public use, making it ideal for a product like SplashID that functions on a wide variety of processors found in mobile phones as well as in notebook and desktop computers. Schneier designed Blowfish as a general-purpose algorithm, intended as a replacement for the aging DES and free of the problems associated with other algorithms. Notable features of the design include key-dependent S-boxes and a highly complex key schedule. Blowfish has a 64-bit block size and a key length of anywhere from 32 bits to 448 bits. It is a 16-round Feistel cipher and uses large key-dependent S-boxes. It is similar in structure to CAST-128, which uses fixed S-boxes. The diagram to the left shows the action of Blowfish. Each line represents 32 bits. 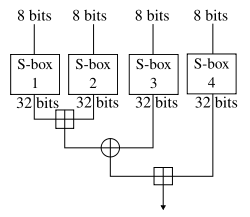 The algorithm keeps two subkey arrays: the 18-entry P-array and four 256-entry S-boxes. The S-boxes accept 8-bit input and produce 32-bit output. One entry of the P-array is used every round, and after the final round, each half of the data block is XORed with one of the two remaining unused P-entries. The diagram to the right shows Blowfish's F-function. The function splits the 32-bit input into four eight-bit quarters, and uses the quarters as input to the S-boxes. The outputs are added modulo 232 and XORed to produce the final 32-bit output. Since Blowfish is a Feistel network, it can be inverted simply by XORing P17 and P18 to the ciphertext block, then using the P-entries in reverse order. Blowfish's key schedule starts by initializing the P-array and S-boxes with values derived from the hexadecimal digits of pi, which contain no obvious pattern. The secret key is then XORed with the P-entries in order (cycling the key if necessary). A 64-bit all-zero block is then encrypted with the algorithm as it stands. The resultant ciphertext replaces P1 and P2. The ciphertext is then encrypted again with the new subkeys, and P3 and P4 are replaced by the new ciphertext. This continues, replacing the entire P-array and all the S-box entries. In all, the Blowfish encryption algorithm will run 521 times to generate all the subkeys - about 4KB of data is processed. Blowfish is one of the fastest block ciphers in widespread use, except when changing keys. Each new key requires pre-processing equivalent to encrypting about 4 kilobytes of text, which is very slow compared to other block ciphers. This prevents its use in certain applications, but is not a problem in others, such as SplashID. Blowfish is not subject to any patents and is therefore freely available for anyone to use. This has contributed to its popularity in cryptographic software.